The spec says control voltage needs to be >2.5V for a logic high. That would explain what I saw: I switch to TX at a voltage >2.5V in both scenarios. How did you figure out which part they used? Do you have a schematic? Ah, you can see the G4C marking, ok. This would seem to have huge implications if running off two alkaline AA cells, which is what's shown in the photo on the OP of this thread: looking at constant current discharge curves of alkaline AA cells, a significant fraction of the useful life of the battery happens below 1.2v. So, just to be clear, in your guys judgment based on the RF switch part, we shouldn't be running below 2.4v as far as the RFM69 radio is concerned? The switch only exists in the rfm69hw, not on the w. So I think the w likely runs down to 1.8v. 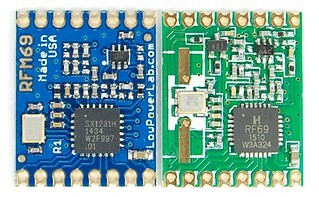 The hw can't switch the high power pa onto the antenna below 2.5v. It still can receive below. It could also send using the low power pa. And it could tx at high power as long as the voltage at the beginning of tx is >2.5v. The last one of these is important for coin cell motes. There will likely work even though voltage will go under 2.5v during tx since in the beginning voltage is pretty high. There are some really interesting questions to ask here. First, why is the rf69 chip specified down to 1.8V for powers less than +17dBm and 2.4V above when the sx1231h specification doesn't? Could it be that Hoperf only wanted to license one chip (the sx1231h) and not two for use in both low and high power modules, and sought assurances from Semtech about these specs before adding them to the rf69? Did that volume then drive the price of the sx1231h down so it is actually cheaper than the sx1231 in volume (seems to be), and Semtech want to keep them separate so the sx1231h doesn't get used in those low voltage, low power applications even though it is fully capable? In my opinion it looks like the rfm69CW and rfm69W devices will work down to 1.8V, the H variants appear to have a component on board (rf switch) that precludes it and is instead 2.4V. Unfortunately, the RFM69 design does not permit using PA0. It would be great if it did (you would have full power output range), but it doesn't. If you want to TX, you need, at a minimum, PA1 turned on. Sure - but the reason is that the Rf switch disconnects rfio during tx. If the voltage is too low for the switch to work you can suddenly use pa0 even though the design prevents its use when voltage is within spec limits. I wonder how one would do it though since you don't know whether the switch will work. Maybe switching all pa's would solve that problem. But then you use even more power than usually. So, is it fair to say that if running an HW with AA alkaline cells, the new version of the "optimal solution" is to keep the LDO and run the Moteino using 3xAA batteries? Because if we really do need 2.5v, and not 1.8v as previously believed, then that 3rd battery really would seem to offer more run-time by allowing you to drain all the batteries all the way down to dead. My understanding is the switch switches between RFIO and RF_BOOST (which in turn uses PA1 and PA2), and switches to RF_BOOST during TX. So just using PA0 on RFIO won't work. If there's not enough voltage for the switch to work even the RFIO connection could be dodgy, it might be high impedance but low enough for the receiver to work in 200R mode but too high for transmission with a lower impedance antenna. Oh it depends on so many factors that one would have to test it. Personally I think 2xaa batteries which are just able to keep the voltage >1.8V over a full Tx cycle of say 10ms at 120mA might well have an open circuit voltage >2.4v. Whether you could still turn the switch at the very beginning - who knows. Try it out and let us know! Good catch @perky, indeed the RF switch is the UPG2179TB, and yes the limitation is actually 2.5v, with a "typical" of 3.0v. So even the 2.5v is a pretty edgy use case. When I build some RFM69 clones I tried to find that switch but it's obsolete, not stocked anywhere so I had to use a different one. The switch Hope uses is found on virtually all boards they make (semtech based at least) including the LoRa radios and has been used for years. It seems they either bought millions some time back and the supply is limited, or it's a clone from asia, or maybe it's still source-able through more obscure means. Does anyone know if the RF topology of the 1231h allows for an integrated component to move all the matching and perhaps the RF switch into a single component (and what that component type might be)?